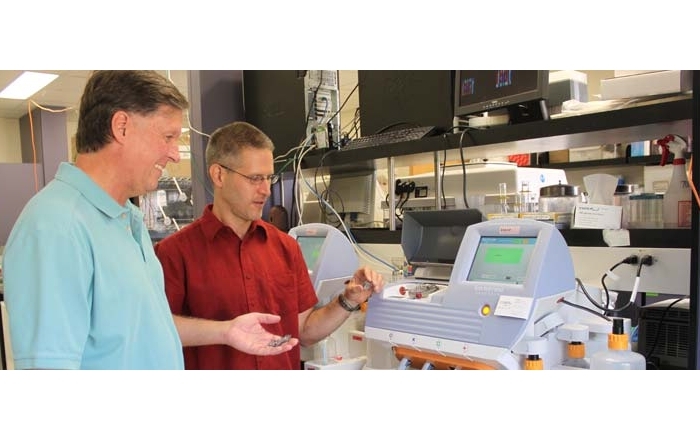 The University of New Mexico Cancer Center is among a small number of sites worldwide to receive one of the first 20 units of the new and anticipated next-generation Ion Proton Genome Sequencer. Genome sequencers help researchers discover the exact sequence of an individual's DNA, which carries the instructions for protein manufacture inside a cell. The instructions are encoded in the DNA bases, or rungs of the DNA ladder-like structure. If these instructions go awry, the proteins that the cell builds may not function properly and improperly functioning proteins can sometimes lead to cancer. Whole Genome Sequencers in use today are quite expensive, so cancer researchers often narrow their focus. 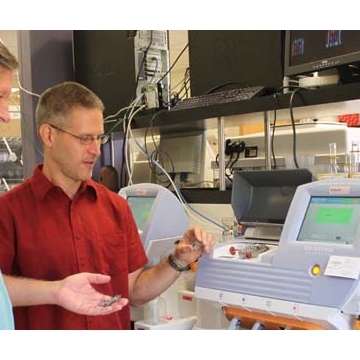 "Right now we typically sequence the one and a half million bases in the regions that are typically involved in cancer," said Jeremy Edwards, PhD, associate professor of molecular genetics and microbiology and chemical engineering at the UNM Cancer Center. "With the Ion Proton, we will be able to routinely sequence the entire human genome, not just a small panel of cancer genes. That's a great advantage." Existing whole genome sequencers can take two weeks to sequence an entire genome at a price of around $10,000. The new Ion Proton Genome Sequencer will be able to sequence the entire human genome of three billion bases in half a day for around $1,000. This faster sequencing means Dr. Edwards can rapidly analyze an entire genome and use this technology in the clinic. Comparison of the entire genome from cancerous and noncancerous cells from the same individual could be used to define cancer treatment, a process known as precision medicine. "We know there are variations in the genome because they're what make us different from each other," said Edwards. Among the three billion bases in the human genome, there are typically millions of polymorphisms—significant differences—that are recognized variations between individuals. But, in a cancer genome there are approximately 10 or so mutations that could be playing a role in the cancer. It is a computational challenge to find these so called driver mutations and devise a therapy to treat the cancer. Being able to determine an individual's specific variations and to note the differences between cancerous and noncancerous cells in the same person will enable researchers and clinicians to individualize that person's treatment even further by linking mutations to their corresponding protein. "If we know where the mutations are, we can find out which ones are causing protein changes, what the protein changes are, and where they are," said Edwards. "Then we can determine what we can do to help this person. What drugs are available to target this protein?" Sometimes, no drug that affects the protein in question is available, but there may be a drug that affects another part of the same chemical process within the cell. In the end, it's possible to recommend a precise treatment for that individual. Precision medicine is still in its infancy. Only clinical labs can be used to dictate treatments for patients in the U.S. and they are monitored much more closely than research labs. However, clinicians can use data from research labs like Edwards' as long as they conduct their own investigation. The patient still benefits, but it's a longer process. "The really big goal right now is to bring this technology into the clinic to improve people's treatment," said Edwards. The UNM Cancer Center is the Official Cancer Center of New Mexico and the only National Cancer Institute (NCI)-designated cancer center in the state. One of just 67 NCI-designated cancer centers nationwide, the UNM Cancer Center is recognized for its scientific excellence, contributions to cancer research and delivery of medical advances to patients and their families. It is home to New Mexico's largest team of board-certified oncology physicians and research scientists, representing every cancer specialty and hailing from prestigious institutions such as MD Anderson, Johns Hopkins and the Mayo Clinic. The UNM Cancer Center treats more than 65 percent of the adults and virtually all of the children in New Mexico affected by cancer, from every county in the state. In 2010, it provided care to more than 15,800 cancer patients. The Center's research programs are supported by nearly $60 million annually in federal and private funding. Learn more at http://cancer.unm.edu.